In this article, we contrast a conventional classroom lesson and its environment with a classroom where Kagan Structures are brought in. We discuss the benefits of the Structures and explain why this alternative approach to classroom organization works much better and has a long-term learning effect. Then, we present six of our favorite Kagan Structures that are particularly suitable for the language-learning context, and we offer you an overview and the support to apply them in your daily teaching routines. For an in-depth presentation of the Structures and our approach to cooperative learning, you can read Kagan Cooperative Learning (2009). Kagan Structures are instructional strategies designed to promote cooperation and communication in the classroom, boost students' confidence and retain their interest in classroom interaction. The Structures work in all teaching contexts—regardless of subject, age group, and number of students in class—and are a particularly powerful tool for teaching a foreign language. Let's compare a typical traditional English lesson to an English lesson using Kagan Structures. For example, we might want to teach direction vocabulary with prepositions of place and direction: next to, down, into, out, up, above, below. In a traditional classroom, the teacher may provide some direct instruction, then do a wholeclass question-and-answer session. 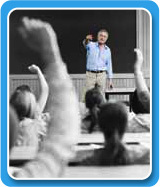 During the question-and-answer session, the teacher usually asks questions, then has students raise their hands to volunteer answers. Alternatively, the teacher may ask a question, and nominate a student to respond. Finally, the teacher may assign an activity for individual work and have the students independently practice the new skill. Sound familiar? Traditional learning is either whole-class, with the teacher leading the class, or independent practice work. As we'll see below, traditional learning lacks a high level of active engagement, creates a more intimidating learning environment, and often fails to establish an effective communicative context for natural language acquisition. Cooperative learning offers a powerful alternative for language teaching—interaction! Many teachers believe Kagan Structures are instructional strategies designed to promote cooperation and communication in the classroom, boost students' confidence and retain their interest in classroom interaction. The Structures work in all teaching contexts—regardless of subject, age group, and number of students in class—and are a particularly powerful tool for teaching a foreign language. They are doing cooperative learning by introducing pair and group work. However, unstructured pair and group work lacks the basic principles of effective cooperative learning, and therefore, does not produce the gains of true cooperative learning. There is a vast difference between Kagan Structures and conventional pair or group work. Kagan Structures carefully engineer student interaction to maximize cooperation, communication, and active engagement by all. Kagan Structures carefully engineer student interaction to maximize cooperation, communication, and active engagement by all. The teacher who is fluent with a number of Kagan Structures would teach the same lesson quite differently. She would likely still provide some direct instruction, but skip the whole-class question-and-answer session, and not do the individual exercise. Instead, she would choose a Kagan Structure that will involve everyone, and encourage sharing and cooperation. On the subject of directions, the teacher might have the students do a RallyCoach— students work in pairs and take turns answering the activity questions. Or, Match Mine would be another productive structure for this lesson. In Match Mine, partners sit on opposite sides of a barrier. One partner, the "Sender," places items in an arrangement. The other student, the "Receiver," tries to match the sender's arrangement, using only the sender's verbal directions. Students use the direction vocabulary in a functional way: Place the square next to the triangle. Place the circle below the triangle. Choosing a cooperative learning structure over traditional methods creates a dramatic positive difference in English language learning. We now know that there are many styles of learning and multiple intelligences. What works for some, may not work well for everyone. Therefore, we need a variety of strategies to reach and teach our students with different learning styles and intelligences. If we always use lectures and independent exercises, we may inadvertently create barriers to English learning for many students. If, instead, we use a variety of structures as we teach, we engage the different learning styles and students' multiple intelligences. The variety creates greater novelty, increases motivation, and maintains attention. Kagan Structures also create greater engagement, lower anxiety, and promote natural language acquisition. Let's see how. One attribute that sets cooperative structures apart from traditional instruction is that structures don't call for voluntary participation. In the traditional classroom, the teacher asks students a question, and only those who know the answer, or who are daring enough to respond, raise their hands. The rest of the class can opt out. When students have the option of nonparticipation, many don't participate. This is especially true for shy students, lower achievers, and early language learners. The result: They don't learn as much or as quickly. With Kagan Structures, participation is not voluntary. Participation is required by the Structure. In RallyCoach, students take turns. Both partners have a very specific role and they cannot accomplish the task without working together. It is the same with Match Mine. Students must communicate accurately to complete the task. In the traditional classroom, the structure does not require participation from every student. It is the same with Match Mine with pair work or group work. If pair or group work is not structured properly, one student can simply do the work, while the others watch, or even tune out. In contrast, the Structures hold every student individually accountable for participating. There is a direct connection between student participation, engagement, communication, and subsequent language learning. In the traditional classroom, when one student answers at a time, the ratio of active engagement is quite low. What's more, the rest of the class sits quietly and there is very little involvement. During our cooperative learning practice, the class is divided into pairs, and at least half of the class is generating language at any time and the other half is directly receiving comprehensible input and practicing active listening. This radically increases the opportunity to decode and produce language.